Want to be notified of a reminder when you arrive at a specific place? Or maybe reminded to do something when you leave a location? 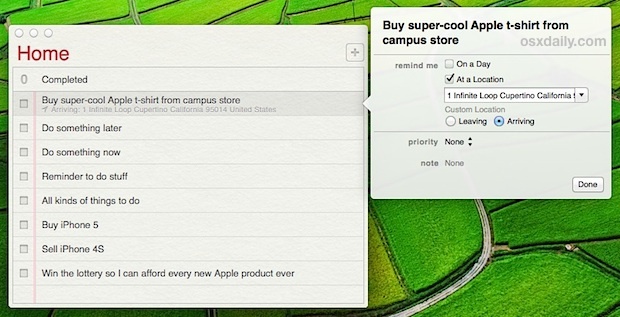 You can do both of these from OS X with the Reminders app, much like you can in the iOS world. And because the reminders sync through iCloud, you’ll be alerted on your iPhone, iPad, iPod touch, or Mac, whichever is available when you arrive at the set destination. Now when you arrive (or leave) at the destination, you will get a reminder notification from the Reminders app about the event. You will obviously need iCloud working and to have Location Services enabled in order for this to function properly, if you turned it off on the iPhone for battery reasons or on the Mac for some reason you’ll want to enable it again. I use these reminders all the time, I offload just about every little trivial thing to this otherwise I hear about it when I get home from the wifey! How come your Reminders doesnt have the black edges?! I really don’t understand how this works in any useful way on the Mac, most of the time. Let’s say I have my MacBook Air set to remind me to take my shopping home when I leave the office, what do I do? I set a reminder to activate when I leave my current location. I finish work. I close the cover of my MacBook, putting it to sleep, and pop it in my bag. I leave work. I get home. Oops, left the shopping at the office – why didn’t my reminder alert me? And it can only be useful in situations when I’m arriving if I know that I will be opening up my MacBook BEFORE I need the alert – so if I set a reminder to “book dinner for next month” when I visit the restaurant later this week then I expect I’ll miss booking that table. Am I missing something? Does a Mac still alert you when it’s asleep or do people walk around with their laptops open and awake? I agree with you. I can’t imagine this would ever be useful on macs unless macs carried 3G or 4G on them. Maybe they will add 3/4G… soon … and it will tie in with PowerNap. It’s the only way it will work as you’d hope most of the time. Now, it’s only OK for reminding you when you get to somewhere that you’ll open your laptop. It’s a good criticism to be aware of, it will not remind you in situations on the go. I just tested this and maybe i’m doing something wrong or it can’t do what I expect. I set a reminder for when I leave work, and another for when I get home. I have the reminders synced to my iphone (3GS) via iCloud and location services are “on” on both my laptop and the phone. When I left work, i was hoping for my phone to pop up with the reminder (as by now the laptop was asleep in my laptop bag), when I got home i was hoping for a reminder too. Nothing happened with my phone, however as soon as I opened my laptop when I got home I got both reminders pop up on the laptop (kinda pointless when I had already left work) but still nothing on the phone. The reminders are listed in the reminders app, but the reminder itself doesn’t occur. Well, I just found out that the location based reminders are not available on the 3GS. Bummer. Other than that it is handy for reminders on the laptop for things to do when I get home or to work. This is lacking one key feature, available in iOS reminders – contacts address integration. In iOS, I can choose from my contacts for a location. In ML I have to type the address.